I enjoyed this book pretty good once I reached somewhere around the middle of it. It was a little bit of a slow starter for me, but I really wanted to like it so I stuck with it. The book contains a good message about what it means to truly live in ones faith and hold strong to family values, even in our darkest times. Plus Ivy the protagonist really speaks her mind, and her humor is witty and a bit snarky, which I like. The story itself was good, but the writing seemed to jump around a lot, and none of the characters were very admirable, especially not the protagonist/narrator. I only managed to get about a third of the way through the book before giving up. I simply wasn't enjoying reading about the main character who was perpetually whining about her absent, obese husband who was offer pursuing dreams of gospel singing glory, while she was stuck at home caring for her children and elderly mom, working for her partying/drinking brother in the family sandwich shop - and feeding their deadbeat dad whenever he showed up. This, is, of course, when she wasn't worrying about her married-well-but-unhappy sister and her sister's ungrateful, spoiled children. I'm sure the author brought about some meaningful, happy, blessed ending, but I couldn't endure reading thru the martyrdom any longer to get to it. I didn't find it awful - just not entertaining or interesting enough to hold my attention - even for a casual bedtime read. This fictional story revealed the stresses of a woman around my age. She's caring for children and aging parents. Her husband travels a lot. The story unfolds in showing God providing answers to her prayers and hope for the days ahead. It's humorous and easy to read. I enjoyed it! Another incredible story of authenticity and grace. I really identified with Ivy's ability to connect to her true human self, sometimes petty, jealous and ungrateful but real and honest. Samson always does a great job capturing flaws and creating real characters in need of God's grace because of those flaws. Like Ivy, I'm always chasing the idea of who I think I should be, and I'm encouraged by her acceptance of herself in her own skin. I thought that the writing voice was engaging and the style good, and it's a bit refreshing to read a novel written as a memoir from a conservative woman's POV. I liked it up until the end, when *SPOILERS* **********************************her husband comes back and owns up to his crap, at which point her personal accountability goes down the drain and she suddenly stops owning up to her own mistakes. She mentions them after he apologizes like once, but they never have a candid conversation about what she was doing. Before that point I liked how they showed her mental process of wanting a relationship with Mitch but at least in theory not being okay with what she was doing. Also, the sum-up of what happened at the end was a bit much for me. The style changed, and it was like a movie in which the ending is voiced-over instead of shown.Other than that I was a big fan. Ivy is caught between caring for her kids at home and worrying about her mother's failing health. And she has to do it all on her own, while her husband travels most of the year with a Christian quartet. Her new friends help her with some major changes in her life. I found this one in the library and thought I would give it a try. I've never read any by this author. It was a clean read, but I didn't enjoy it as much as I wanted to. It starts off really slow and I got bored, so I skipped ahead to see if it was worth continuing. It did pick up towards the last 1/3 of the book, but that's a long way in. I was hoping for more. Not terrible, but not worth reading again. I haven't decided if I'll give the author another try. This book is about a woman who is pulled in many directions by her family. She takes care of her mother, her husband is always out of town - a gospel singer, she cares for children from age 3 to teen, and both her father and her father-in-law are also living in her house. Her mother doesn't know her husband is living in the basement because they have to keep it quiet as they are divorced. She also helps run her mother's restaurant where her brother (who is an alcoholic) is the chef. She has a sister who thinks money solves all problems. Anyway, it's about the ups and downs of being caught in the middle of generations. After reading this book, your life may seem very uneventful. Lisa Samsom writes with compassion, humor and is delightful in her presentation. I liked the premise of this book - the story of a woman caring for her kids and her aging mother - although some aspects of the execution are a bit weak. 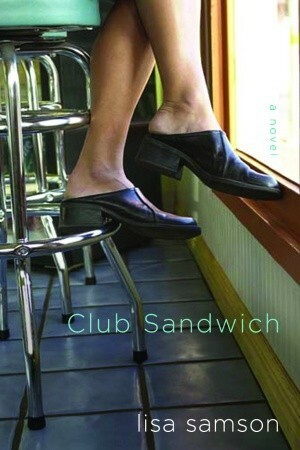 In fact, the actual "Club Sandwich," a group of women with similar issues, sort of spontaneously appears in the book and isn't actually developed much. The narrator states up front that she is Christian and conservative, and most details relating to these two traits did not resonate for me. She doesn't quote scripture, but she does talk about God, Jesus, and church. However, I thought the characters and dilemmas were interesting enough to persevere. This is so far been my favorite Lisa Samson book. Her books are just always so real, there is no fluffy Christian faith in them. I wasn't too sure when I picked this book up that I would like it, but within the first two pages I think, I was already hooked. Samson writes characters like you would not believe. They are real people with real problems and you feel like you get to know them, at least for a time. BORING!!!!! It takes halfway through the book for the 'club' to even begin meeting. The main character complains she has too much on her plate, yet complains that no one else does anything, and keeps taking on more and more responsibility. Just say NO! Yet 3/4 way through the book tells one of the club members to do the exact opposite of what she is doing!!! Would not recommend. Just kept reading to see if it got any better. It didn't! I read this book a few years ago, and enjoyed it. But as I find myself being squeezed by demands from different generations, I have a greater appreciation for the challenges faced by the main character and especially her responses. As with Lisa Samson's other books, her characters are real. I appreciate Samson's honest portrayal of the Christian life. This was quite an interesting novel. I felt bad for the main character because she had so much on her plate. Reading this book made me tired.I liked the idea behind it that everyone needs some support from family and friends. I read this book a while ago and really enjoyed it. I felt like I was right there with all of those characters. I also liked that the christian life was presented in an everyday, realistic way that the majority of us can relate to. Listened to the audio book. Enjoyed it but the situation was artificial and somewhat contrived. The exploration of the sandwich generation issues was good, but didn't all quite work. having cared for an aging parent and young kids I could really identify with the story. Great book about an average life.Slow start, almost gave up, but came to see that the book is for real people living like me. Great book, check it out! Not loving this...I keep rolling through it because I think it might get better. Samson's writing style is jumpy and inconsistent. Couldn't finish it. And I'm a big Lisa Samson fan, but this took so long to hook me that I became the reader who got away. Slow, slow start. bleh. I couldn't even get into this book. I need a little more inspiration in my inspirational fiction. sad marriage, mom struggling with kids, diner, etc. This was a fun read for the most part with some good human interaction and how we all need and feel the same things, just in different ways.